I’m already planning a visit back here in summer because I have been told I may see bears. Real bears. And they won’t eat me. Allegedly. As I was just learning to snowboard (maybe attempting to learn is more accurate! ), they would only let me on the baby slopes, which were quite big enough for me, thank you very much. However, on my explorations, I saw how many pistes there actually are and I didn’t even leave Whistler Mountain. I didn’t actually do this but I think it’s fabulous that there is a gondola connecting Whistler and Blackcomb mountains which gives you access to over 200 trails and over 8,000 skiable acres. And I’ve loved what I’ve seen of the ski area on Whistler Mountain. Whistler really hit my radar when Vancouver hosted the Winter Olympics in 2010 (Simon Ammann’s double-double! Didier Défago! Carlo Janka! Amy Williams!) and that is what really sparked my desire to visit. So arriving in Whistler and seeing the Olympic Rings in the Olympic Plaza was so exciting for me. There are also several Inukshuks (trail markers made from rocks stacked in human form). 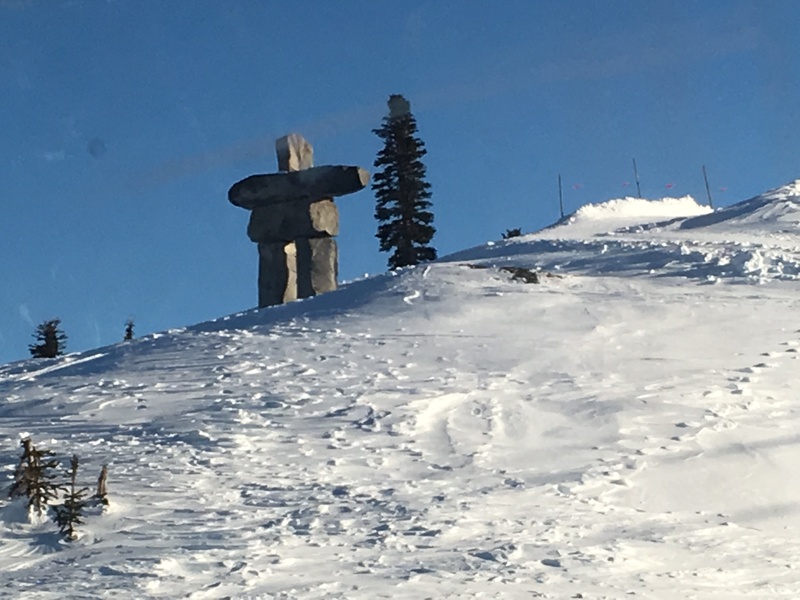 I saw the one welcoming visitors to Whistler village and the one at the top of the gondola on Whistler Mountain. The 2010 hosting facility for Team Canada is now Whistler Library so obviously I visited that – books and free wifi in a stunning setting, what’s not to like? The library is also next door to Whistler Museum which has a great exhibit on the Games. Whistler Blackcomb Roundhouse Lodge at the top of the Whistler Village gondola (home to the pumpkin cheesecake) also has a set of Olympic Rings and a replica podium – I resisted the urge. There is also a display of memorabilia including Didier Défago’s skis. I didn’t visit the Sliding Centre because I decided I wasn’t brave enough to try bobsleigh yet. Apparently you can also try skeleton but I just don’t think I’m that crazy. Whistler definitely kept the Olympic legacy alive and lots of the facilities are still open for use. You can apparently even ski the actual downhill course! The museum has a wide variety of exhibits covering everything you could want to know about Whistler from geology to wildlife, and from its beginnings as a ski resort to finally hosting the Olympics (a 50-year journey). I also discovered that my host in Whistler had a hand in the infamous Toad Hall poster (click at your own risk!). There was also a fascinating film on Whistler’s history running but at 118 minutes long, I bought a copy to watch later. I’ve been waxing lyrical about the food (I wonder whether I should rename this site EatingMyWayAroundTheWorld) but it is some of the consistently best food I’ve eaten anywhere and certainly better than anything I’ve ever eaten in a European ski resort (except possibly Apfelstrudel in Zell!). I loved my time in Whistler so I think as I cross “Snowboard in Whistler” off my to-do list, I may just add it again at the bottom and plan to come back. Maybe I should start saving already. Anyone want to come with me?